On Aug. 31, 2017, the Indian Space Research Organisation (ISRO) launched its latest navigation satellite. During the flight, however, the payload fairing did not separate several minutes after liftoff like it was supposed to, leaving the spacecraft trapped inside the clamshell-like aerodynamic nose cone. With the payload fairing (sometimes called the heat shield) still attached, that meant unneeded weight continued to travel uphill with the rocket. This caused the rocket to reach a lower than planned orbit of about 103 miles (167 kilometers) by 4,073 miles (6,555 kilometers). But worse, because the spacecraft was still encapsulated, the satellite was unable to be deployed away from the launch vehicle. This was the eighth satellite launched for the Indian Regional Navigation Satellite System (IRNSS). The IRNSS-1H satellite was meant to be a replacement for another satellite, IRNSS-1A, that was launched with faulty equipment in 2013. It was in July 2016 when the first of IRNSS-1A’s three Rubidium atomic clocks failed. The other two were followed shortly after rendering the spacecraft useless for navigation purposes. The launch of IRNSS-1H took place at 9:30 a.m. EDT (7 p.m. Indian Standard Time / 13:30 GMT) from the Satish Dhawan Space Centre in Sriharikota, India, using a Polar Satellite Launch Vehicle (PSLV) in the “XL” configuration, meaning it had six lengthened solid rocket boosters. 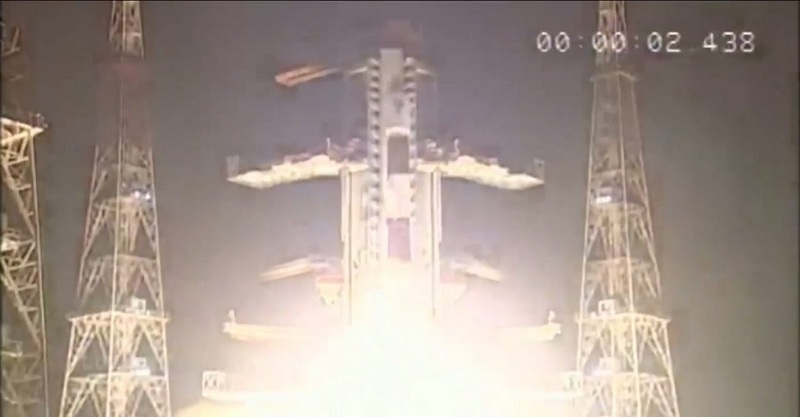 It was the 39th operational launch of any PSLV rocket, which stands 144 feet (44 meters) tall. Other than the maiden flight in 1993, all PSLV rockets had delivered their payload safely, with one being deployed in a lower than planned orbit in 1997. This rocket was supposed to have placed the IRNSS-1H satellite into a sub-geosynchronous orbit with a low point of about 170 miles (280 kilometers) and a high point of about 12,830 miles (20,650 kilometers) at an inclination of 19.2 degrees. The spacecraft carried navigation equipment as well as a ranging payload and was to transmit signals to users on the ground once operational. Moreover, it would have operated in the L-5 band and S-band frequencies. Importantly, the satellite had three functioning, highly accurate Rubidium atomic clocks on board. Of the seven operational satellites, three are in a geostationary orbit at 32.5 degrees, 83 degrees, and 131.5 degrees East. The other four are in geosynchronous orbits inclined at 29 degrees. All are interoperable and compatible with the U.S.-based GPS and European Galileo navigation constellations. IRNSS-1H was one of two spare satellites that were or are being built. Over the next several weeks, it would have used onboard propellant to circularize its orbit into a geosynchronous orbit inclined 29 degrees from the equator. In a press conference, ISRO chairman AS Kiran Kumar said that the mission was deemed a failure. It is unclear when the next navigation satellite, let alone the next PSLV, will launch. Prior to the failure, a PSLV was slated to fly by Dec. 28, 2017, with the Team Indus and Team HAKUTO lander and rovers bound for the Moon. The two teams are competing for the $30-million-dollar Google Lunar XPRIZE, which has a deadline of March 31, 2018. Glad to read your informative post. Thank for sharing admin.